The 6 Station Portable Restrooms Trailer | Classic Series is designed to impress and is a perfect choice for your next high-traffic event. This crowd-pleasing, upscale facility will surpass your guests’ expectations with easy-entry access, large privacy-stall doors, and custom cabinetry with abundant storage throughout. Each restroom suite includes white ceramic china pedal flush toilets, full vanities with solid surface countertops, and large stainless steel sinks with self-closing metered faucets, and vinyl flooring that is easy to clean. 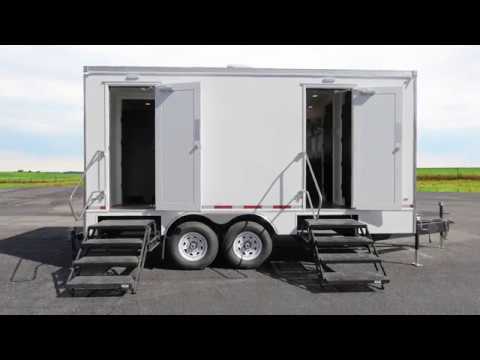 Your guests are sure to enjoy this 6 Station Portable Restrooms Trailer which has a fully climate-controlled environment maintained by air conditioning and heat strips, as well as a 3 Season package for cooler temperatures. This trailer is also upgraded to include LED lighting and a water heater so your guests can enjoy a hot water hand wash.
Download the 6 Station Portable Restroom Trailer | Classic Series PDF Brochure from Portable Restroom Trailers, LLC.